Liebster Award from Don Charisma! Don Charisma.org (http://doncharisma.org) has nominated me for the Liebster award. Seeing as this is my very first award I want to give him a big shout out of “THANKS!” I appreciate that other bloggers are interested in the things I am sharing on here. 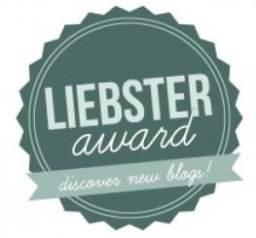 The Liebster award is to small blogs by other bloggers as a way to increase traffic and readership. I’m honored to have received this award – it totally makes my week! 1. Who’s your favourite fem fatale? Mrs. Robinson from the movie The Graduate. I don’t know, there was something about the way that she knew exactly what she wanted and went for it. Crazy as she was, she still made me laugh at her confidence! 2. What do you like about WordPress blogging? I love being able to express myself in written form for others to read, and perhaps relate to or enjoy. It is also a great way to share my training philosophy with others. I also love that bloggers seem to be so kind which is refreshing. 3. If you could be any public figure, who would you be and why? I don’t know that I’d want to be anyone in particular, but I’ve always fancied holding a political office where I can make positive changes in the world. Of course my low tolerance for BS and politics would make me a very bad politician! 4. Three things you don’t like about Facebook? Privacy invasion issues, viruses, negative and nasty people. 5. Three things you do like about Facebook? Marketing, keeping friendships alive that would have died otherwise, being able to get in contact with someone during a crisis or emergency. 6. If you could do anything and there was no limits, what would you do? I would do exactly what I’m doing only more of it with more time! I would try to learn everything that I could about yoga and the physical body! 7. If you had to describe my Don Charisma blog to friend, how would you describe it ? 8. Most inspiring film (movie) you’ve ever seen? Freedom – there is no other choice. 10. What you’d most like to see change in the world. I’d like to see everyone be a little less afraid and a lot more daring. I would love to give everyone the confidence and faith to just go out and do it! Tempt fate. Take a chance. You might fail but you’ll have a lot of fun doing it! 2. I’m pretty outspoken…surprise – I’m a redhead and outspoken?! 3. I’ve only owned two dogs in my life. A beagle who lived to be 16 and my current dog, Cassie, a dachshund/Jack Russell Terrier mix. 4. I was overweight as a child and into my late twenties. 6. I had a lisp as a child. I couldn’t say “S” very well and my name is Susie. I pronounced it “Thuthie. What was my mom thinking? 7. I used to smoke and when I quit smoking, it caused me to stop reading fiction. I never understood why that happened. 8. I have owned and ridden 3 motorcycles in my lifetime. The first one I bought from a boyfriend. I dumped him and kept the motorcycle. I definitely got the better deal! 9. I’m a black belt in Taekwondo. 10. I don’t have a lot of close friends but I’ve had them for a long time. 11. I have ran a lot of races, even a marathon, but I don’t really like to run and I’m not very good at it. 2. Do you have any pets? If so, what kind? 4. If you wrote a novel, what would it be about? 5. Have you ever read a book or seen a movie that mirrors your life? What was it? 6. Spring, Summer, Fall or Winter? Now for the rules…everything comes with rules, right? Please include 11 random facts about yourself, as well. Thanks again for the nomination and congratulations to all of the nominees, as well! Happy Blogging! Congratulations on getting your first award, I’m so happy for you 🙂 You deserve. Thanks, Lucas! It was my pleasure…your story has inspired me so much! How are you doing?